Explore the fun of Morse code! 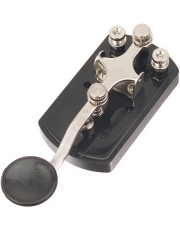 This Morse code straight key includes an adjustment for tension and an adjustment for gap size. The base includes mounting holes. Also available: ARRL Morse Code Oscillator Kit. Put your key to use with this basic electronics project, and learn the Morse code!